The titular single from No Room For Bullies is a track that meshes together a wide array of different music styles, with hints of Macklemore, Linkin Park, and Bon Jovi. The narrative weaved through this introductory track has a positive message; one should be empowered by their experience rather than be hurt by bullies. The different twists and turns that listeners will experience during this first salvo ensure that one sticks with the latest Mr. Ray release. The Rainbow World keeps things interesting through the inclusion of a children’s choir and just enough grit to keep things interesting. The production of the tracks on No Room For Bullies ensures that each effort could easily make it onto radio rotation; each piece of Mr. Ray’s flow and note included on the composition are able to shine alone as well as contributing to the overall spirit of the effort. While this is a theme release, I feel that Mr. Ray has the chops necessary to rocket up the chart. Be Who You Are gets into a funky groove due to the interplay between guitar and drums, while Get Real is a great late-album track. The building up of the track’s momentum makes for a delectable rising and falling motion, keeping listeners firmly planted for the one-two conclusion of the album. Put Your Mind To It and It Was in Your Heart may wind down No Room For Bullies, but they hold important messages for anyone that may be looking for support. 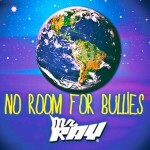 Mr. Ray is able to create a thematic album and have it succeed wholly on its own merits, all while letting listeners understand the prevalence of bullying.